What Does Cold Weather Do to Tire Pressure? Home » Tips & Tricks » What Does Cold Weather Do to Tire Pressure? Have you ever had the unfortunate experience of heading out the door with somewhere to be, only to find your tires were incredibly underinflated? If this has happened to you, we’ll bet it was sometime in the fall or winter when the temperature was very low. It may seem strange, but temperature does have a huge affect on the air pressure of your car’s tires. Even though many new cars, like Nissan vehicles, are equipped with a Tire Pressure Monitoring System, it is still important to keep an eye on your tire pressure frequently. This is especially true in the fall and winter because lower temperatures have an affect on the pressure that can affect driving. So, what does cold weather do to tire pressure? In the colder months when the temperature gets very low, the cold weather can cause tires to underinflate. There is a relationship between temperature and pressure where lower temperatures also lower air pressure. Higher temperatures will also increase air pressure. This means that the pressure of your tires will vary with the temperature outside. If there is a drastic change in temperature, this can cause the tire pressure to fluctuate more significantly. The first cold day of fall or winter can cause your tires to deflate more than normal. When the temperature is lower, we recommended checking the tire pressure at least every month, if not more often. Of course, your Tire Pressure Monitoring System will pick up on the fact that your tire pressure is low, but it’s good to keep an eye on it and get ahead. When you check the tire pressure, it should be in the morning when the tires are still cold. Any driving can warm up the tires and increase pressure, which will throw off the pressure reading. You can find the correct tire pressure in your vehicle’s owner’s manual. 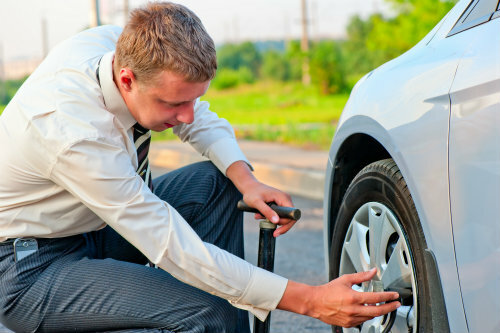 If you find the pressure of your tires is lower than recommended, you should inflate them as needed. It’s important to do this because driving on tires that are underinflated will cause issues with handling and affect fuel economy. Always keep an eye on your tire pressure and make sure your tires are inflated properly. If you would like more tips like this, continue reading the tips and tricks section of our blog. This entry was posted on Sunday, November 29th, 2015 at 12:00 am	and is filed under Tips & Tricks. You can follow any responses to this entry through the RSS 2.0 feed. You can skip to the end and leave a response. Pinging is currently not allowed.